How do you approach this child ? Well, there are no hidden tricks with this case. This is not a fancy diagnosis, rather a very common one. I feel that if you are in a department that sees children, then you need to know Paediatric DKA back to front & be able to manage it with a certain level of finesse, particularly as there is certainly the potential to do more harm than good. What are your principles of management? I wanted to use this case as a vignette to bring the following paper to your attention…. * Correct acidosis & reverse ketosis. * Restore blood glucose to near normal. * Avoid complications of therapy. * Identify & treat any precipitating causes. * Severe volume depletion w/out shock. - Volume resuscitation begins immediately w/ 0.9% saline. - Do not exceed 30mL/kg in first 4 hours. * DKA w/ shock (rare). - don't forget the intraosseous route ! * Subsequent fluid management (deficit replacement). - 0.9% Saline or Hartman's for at least 4-6 hours. - Calculate fluid deficit (ie. 5 vs 7 vs 10% dehydration). ~ Avoid rates of > 1.5-2x usual daily maintenance requirements. - No need to add urinary losses to fluid calculations. (if Na+ not increasing w/ appropriate therapy). * Start insulin infusion 1-2 hours after commencing fluid replacement. - ie. after initial volume expansion. * Dose = 0.1 units / kg / hour (via infusion). - reduce to 0.05 units/kg/hr in those w/ exquisite insulin sensitivity. - do not use boluses !! * Continue insulin until DKA resolves [ Target BSL ~ 11mmol/L ]. - ie. pH > 7.3, HCO3 > 15 mmol/ or anion gap is closed. - consider adding earlier w/ rapid glucose drop (>5mmol/hr). - up to 10-12.5% may be required to correct acidosis. * Children w/ DKA have total body deficits of up to 3-6 mmol/kg. * Replacement is required regardless of serum K+ concentration. ~ start K+ replacement w/ initial volume expansions. ~ concentration of 20mmol/L should be used. ~ start K+ replacement after expansion, before insulin therapy. ~ defer K+ replacement until urine output is documented. - Potassium concentration of 40mmol/L. * Maximum replacement is ~ 0.5mmol/kg/hr. * No clinical benefit from routine replacement. * Severe hypophosphataemia w/ unexplained weakness should be treated. * Potassium phosphate can be used with KCl to replace both. * Severe acidosis is reversible by fluid & insulin therapy. - Insulin stops further ketoacid production & generates bicarbonate. * No clinical benefit from bicarbonate administration. - May cause paradoxical CNS acidosis. * Responsible for 60-90% of all DKA-related deaths. 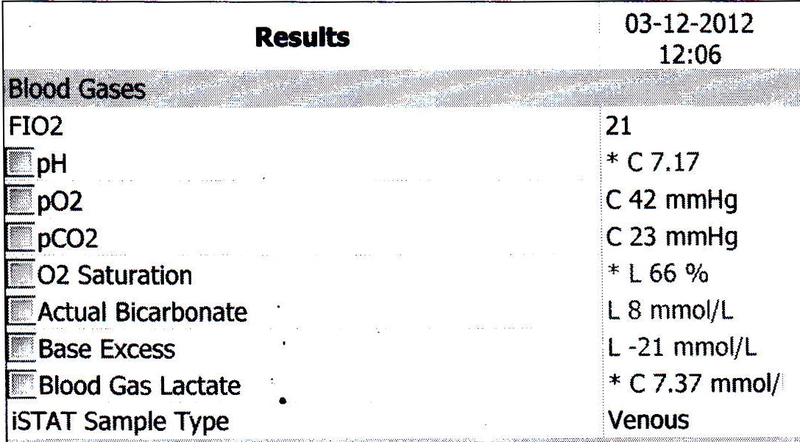 * Incidence ~ 0.5-0.9% of DKA cases. ~ 0.5-1.0 grams/kg over 20 minutes. ~ repeat if no response in 30-120 minutes. ~ 5-10mL/kg over 30 minutes. - Intubation. Avoid aggressive hyperventilation. ~ confirming diagnosis/assessing for alternate diagnoses. Wolfsdorf, J. et al. Diabetic ketoacidosis in children and adolescents with diabetes. Pediatric Diabetes. 2009. 10 Suppl 12: 118–133.